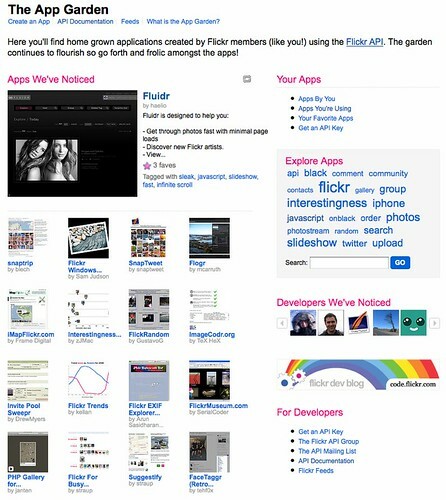 Since the launch of our API in August 2004, software developers have built and innovated on top of Flickr’s open API. The results continually amaze us because they have enhanced the Flickrverse, enabling our members to do more with their photos. Gorgeous, fun, remarkable and useful things — these labors of love are certainly deserving of more recognition. We’re happy that starting today, these creations will now have a home on Flickr, within a place we call the App Garden. If you’re a developer and are looking for information about how to use our APIs and submit your application into the App Garden, head on over to our Developer Blog for more information. If you’re looking for neat ways to do more with your photos, developers are beginning to seed the App Garden and showcase their applications. We hope you’ll enjoy new ways to browse, view, upload, download, analyze and make stuff (whew!) with your photos as much as we do. So take a stroll, try some applications, and come back to see how the Garden grows! If you’re keen to learn more, here are FAQs to get you started. If you noticed bugs or have feedback about the App Garden, mosey on over to the Help Forum. 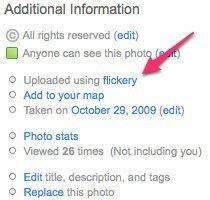 In addition to Flickr’s official uploadr, there are quite a few other uploading tools created by developers with different options and features. If you ever wondered what other people are using to upload you can now see that on the photo page, for apps that have created a page in the garden. If you don’t want this to show you can turn it off in your account settings. Photos from armisteadbooker, Andrew Kufahl, minusbaby, sean dreilinger, and Jamie Basso.